Home » 2015 Pantone » 2015 Pantone Quilt Challenge – Open For Entries! 2015 Pantone Quilt Challenge – Open For Entries! Due to the wonder of time zones, the challenge might look like it’s opening a day early to you. But fear not, it will still go until the stated time: April 24, 11pm Pacific! The 2015 Pantone Quilt Challenge is open for entries! You can link up here or over at On The Windy Side – the linky runs across both blogs so it doesn’t make a difference where you link up. 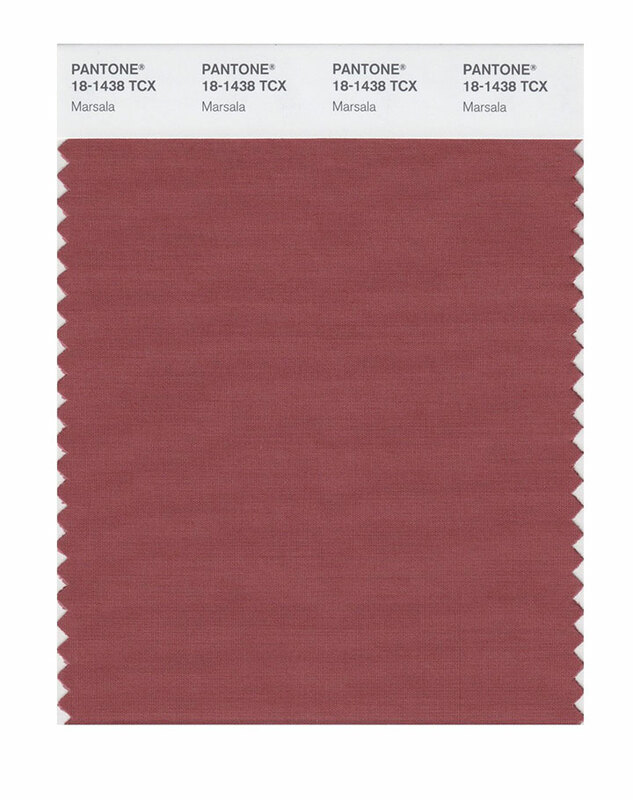 This swatch is the official Marsala color. We know that finding fabrics in this exact color isn’t easy, so don’t worry, the fabric in your quilt does not have to match Marsala perfectly, but should be in the spirit of the color! Before you link up, check out the rules, our wonderful sponsors and our amazing judges! All items must be finished in 2015 to be eligible to win prizes. We will be enforcing the rules and will remove any entries that don’t meet the requirements. See below for more information about a separate linky for quilts that don’t meet the requirements. – Minis: Shortest side under 30″. Pillows, table runners, place mats, mug rugs, etc. will count as minis. – Quilts: any size from baby to bed (shortest side must be at least 30”). – Just the Top: any size from baby to bed (shortest side must be at least 30”). 2. This is the Marsala Quilt Challenge, so your project must contain at least some Marsala or similar colour. You can also use any other colours or neutrals you like (and as many as you like). That said, we would like to see Marsala as the feature colour of your quilt and we will be asking the judges to take your use of Marsala into account when making their decision. 3. You can submit one entry per category. Entries for quilts and minis should be completed projects, including quilting and binding. As you can tell, we have expanded the viewer participation element of this challenge so that there is a viewer’s choice award for each category. We know you’ll have fun looking at all the entries and voting for your favourite in each category. Finally, we would really really love to see an entry from absolutely everyone who feels the slightest bit inspired by Marsala, regardless of skill level, so an entry in each category that hasn’t already won a prize will be drawn at random, and will win one of: a $25 gift certificate from Sew me a Song, a a set of four large spools from Aurifil, or a £20 gift voucher from Karen Lewis Textiles. We are delighted to have three fantastic guest judges on board. These ladies are seriously talented quilters, designers and authors. We love their work and know they’ll do a fantastic job when it comes to judging your entries! From left to right: Amy Gunson from Badskirt, Jeni Baker from In Color Order, and Kristin Link from Sew Mama Sew. 1. Entries are open NOW and will close on April 24 at 11pm PDT. The link-up tool below should tell you how much time the link-up has to run BUT if you need to know the closing time in your country, World Time Buddy is a really excellent visual way to see different time zones. Winners will be announced on April 29 2015. 3. Each entry must include quilt dimensions. If you haven’t used a link-up tool before, Katy from The Littlest Thistle did a post which explains how to use it really well – you can find it here. If you’re planning to use instagram to link up, Katy from The Littlest Thistle has done another tutorial on how to link from instagram using your computer (here). If you are working on your phone or your tablet, Rhonda’s tutorial on how to link from instagram (here) is for you. Please enter your quilt in the correct category, BUT if you make a mistake, the link-up will allow you to delete your own links so you should be able to put it right no trouble. Non-judged entries: We thought it would be fun to provide a place for people to share quilts that feature Marsala that don’t comply with the rules for the 2015 Pantone Quilt Challenge: Marsala (for example, because they were not finished in 2015). We will be providing a separate link-up for people to share these quilts. However, they will not be eligible for judging, voting, or to win prizes. If you link up a quilt that is not eligible for the contest, we will move it into this category. I look forward to seeing all your entries! You SO got this!! 😀 I just finished quilting on mine! Well I think it’s finished. I need to let it settle and then look at it again and see if I like it or not. I finished my top right after taxes, then celebrated by going out to Casa Nostra for dinner, where some of the napkins were…. Marsala! I don’t have a blog/instagram/flicker, so I may not end up linking, but it was a fun challenge and used up a huge amount of scraps, well worth doing! Wow, that’s hilarious that the napkins fit the theme! 🙂 I hope you decide to sign up for instagram or flickr, both of them are free! Otherwise I will settle for seeing it at the next meeting which I think I might actually be able to make! That’s fantastic that you got to use up some scraps in the process! Thanks for hosting! Glad I could finally participate in one! Got home from work and finished the binding just in time for a photo before sundown, felt like celebrating! However, I have had a hell of a time linking up. I just met Flickr and already I hate him/her- spent two hours in head-banging frustration, but here it is! Forget quilt workshops, I need an IT/hand-holding session. Looking forward to seeing all the other last minute entries as well. Oh Gene, I love yours! I am so glad you found a way to post it. Paper piecing on the cap? Thanks Shelley, I had a love/hate thing here, but I really learned a lot- first time paper piecing and I got all confused with the freezer paper. Even so, way easier than Flickr! I really love that Apron! Wish I had a pattern for that one!